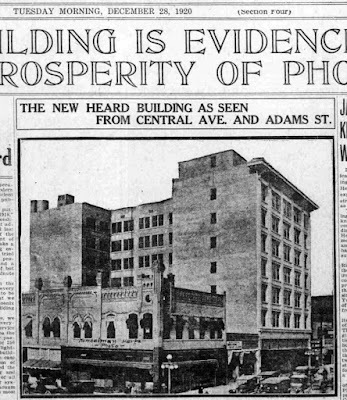 If you look very carefully in downtown Phoenix, on the west side of Central Avenue between Adams and Monroe, you can find the Heard Building. It's only nine stories tall, but in 1920 it must have been absolutely amazing. 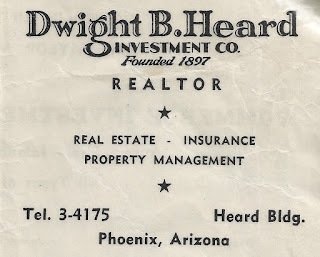 And it was a symbol of the prosperity of Phoenix, and one of it's most successful citizens, Dwight Heard. 1949 ad for the Dwight B. Heard Investment Company. Note the address is simply "Heard Building". No address necessary. Yes, Dwight is the same guy who created the Heard Museum. That is, he and his wife Maie, who was also his partner in their Real Estate business. To me, Dwight and Maie represent just about the ultimate of "unrealistically optimistic" people about the future of Phoenix. They arrived in Phoenix as a young couple, started their Real Estate Company in 1897 with the help of her father, and well, got rich. Very rich. And in 1920, Dwight must have absolutely blown everyone away with the gigantic "skyscraper" on Central Avenue. The old Heard Building in 1908, southeast corner of Central and Adams, Phoenix, Arizona. Time-travel with me to territorial Phoenix. Speaking for myself, I wouldn't have invested in Phoenix Real Estate. Who would want to live in such a harsh climate? And the streets of Phoenix, which were dirt, turned into mud every time the town flooded, which was every darn year. And some years, like 1891, were really, really, bad. But Dwight and Maie believed in the future of Phoenix. They encouraged investment, they sold real estate. 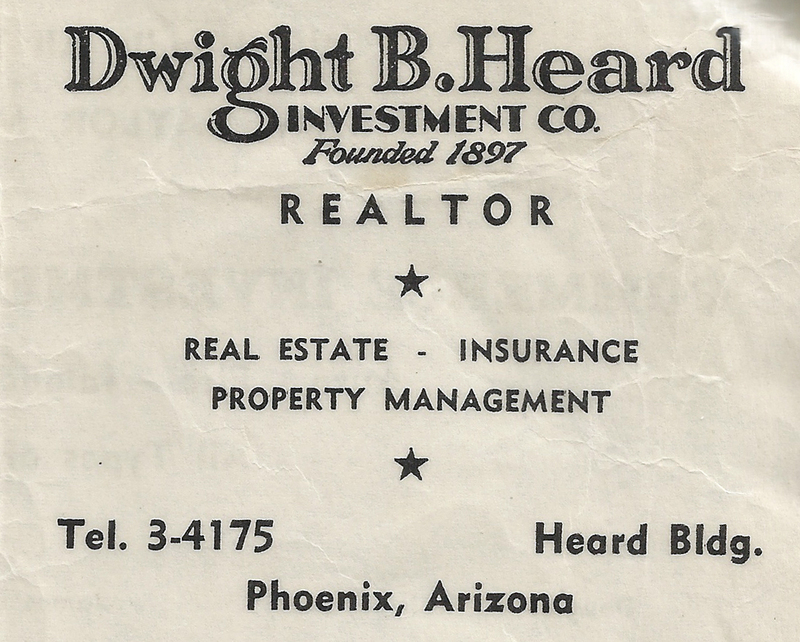 Although Dwight Heard never held a public office (he ran for Governor in 1924 and almost won), he was a pretty big mover and shaker in town. 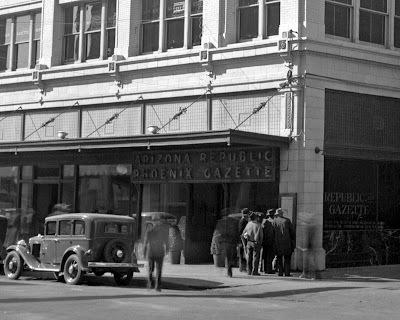 He ran the newspaper, the Arizona Republic. He had friends in high places, like Theodore Roosevelt, whom he encouraged to help build a dam on the Salt River in 1911. As of this writing, the Heard Building is still there, and hopefully it will be preserved. As a symbol of "unrealistic optimism" about the future prosperity of Phoenix, no other building compares.